« Bobby Lynn, Vote: What For? From September 1977 to December1978, eleven issues were produced by a collective composed primarily of anarchists & libertarian socialists. The exception was Jim Torley, a community activist from Possilpark who earlier in ’77 had brought out The Source, his solo attempt at an alternative paper from Glasgow. It had only been a couple of years since The Glasgow News had folded, which involved Brian Barr, Ron McKay and Paul Gordon and which operated from the SCCL office in Holland St. GN was more investigative journalist in style than the GPP. , which took it’s Peoples Press name from the Aberdeen paper which had pioneered muckraking in the ‘boomtown’ of the North-East. Over 11 issues the collective dwindled in participation but persevered. No.7 heralded a slightly changed format. A talented cartoonist, Alec McCartney created a series of agitational cartoons. Around the same era, with Henry Daly produced Clydesider, a paper with similar aims bringing out a couple of issues. GPP attracted some advertising such as Grassroots wholefood shop. It also attracted some letters not all approving of the “journalism” which was often not fully researched! Taking one issue, No.6 in May ’78, had as it’s centre-fold a story by Robert Lynn on Sabotage. 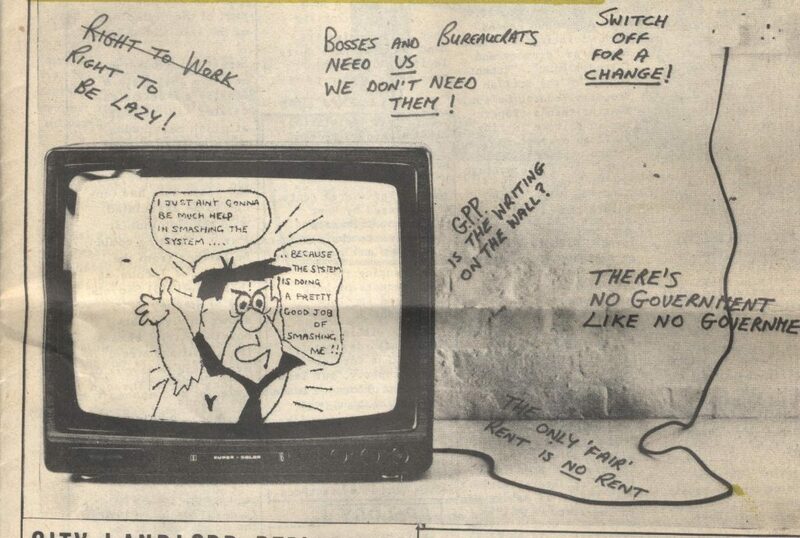 Lynn has been featured elsewhere in the SOR but here he was drawing on his syndicalist leanings. It also chronicled Housing action in Penilee, a scheme on the boundary with posh Ralston; Barlinnie; Bob McKenzie on Summerhill School experiment; the origins of Mayday, the recent Garscadden by-election and impending General Election (not held till ’79 when Thatcher’s Tories capitalised from the “winter of discontent” and ushered in their frontal attack on the miners and de-industrialising much of the British economy). This was the Punk era and some articles in other issues draw attention to that. The GPP was part of a homage to Italian autonomist politics : “takeover the city”. Introduce and develop contestation to the authorities in communities and undermine capitalism. A politics of hope, or some cruelly might add, dope! GPP finally ended due to a combination of fatigue and shame. The latter due to having to apologise to a landlord for printing an issue in Number ten. It cost the author (KM) his place to stay as well, since the flat owner wasn’t amused at getting angry calls due to the “newsdesk” (the pay-phone, appropriately situated on the way to the toilet!). Image from issue No. 11. Issue No. 6. Read on line, PDF and other downloads.